Christopher Street nowadays seems like a calm, even sedate neighborhood – like much of Greenwich Village, a residential oasis in the midst of the big city. On a westward stroll towards the Hudson River the visitor encounters only a few relics – in one sleazy stretch – of the former wild lifestyle that flourished here. And there are even fewer reminders of Christopher Street’s more distant past as a grimy commercial and transportation center. It seems that Christopher Street has become like many other streets in New York – or have many other neighborhoods become like Christopher Street? In any case, the visitor eventually encounters – somewhat surprisingly – on the north side of the street the red brick façade of a church decorated with white stone facing and surmounted by two steeples. 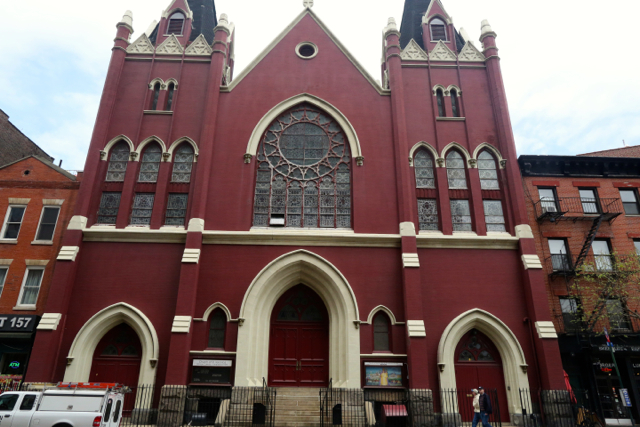 This is the former parish of St. Veronica in the West Village, now a mission of St. Bernard’s/Our Lady of Guadalupe on West 14th street. There remained among the local population of the Village lingering, distant memories of the old St. Veronica’s parish. Memories, which dated back to a time in which the poverty of a parish was not an indictment or an invitation to restructure the parish out of existence. Many years ago near NYU I had a conversation with an elderly lady who, I believe, had been a resident of the Village her entire life. She spoke of how the Catholics of that part of the city admired the longshoremen of St. Veronica’s and the fervor of prayer there. 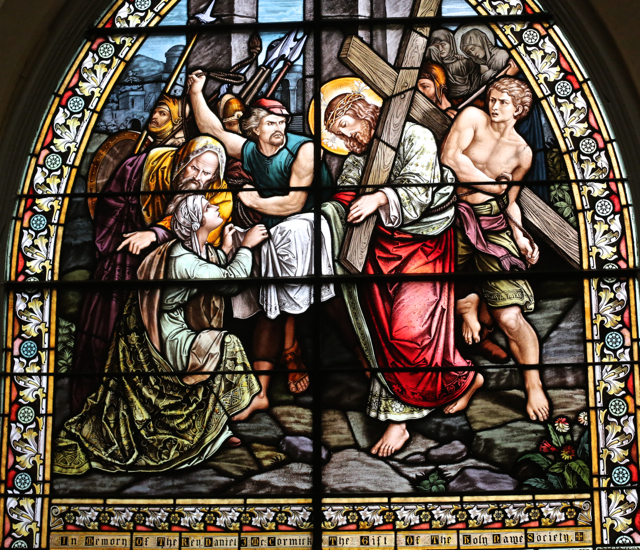 They gave heroic witness to the faith despite great economic hardship. That Catholic ethnic milieu and that working class society disappeared long ago. By the nineteen-seventies Christopher St. had undergone one of the most radical cultural changes of any neighborhood in the city, even the country. It had become the national center of American homosexualism. It was a nonstop carnival. 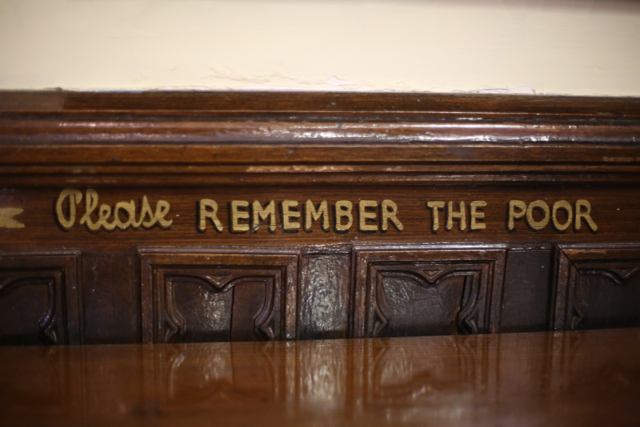 No parish in the city, not even Holy Cross on West 42nd St., faced such a hostile, challenging environment. And by the 1970s, the Catholic population of the Village as a whole – and not just that of St. Veronica’s parish – continued its precipitous decline. We suspect too, that there was little or no effort made to reach out to the new inhabitants, however difficult that mission would be . By 2007, St. Veronica had been downgraded to a mission of Our Lady of Guadalupe and has been threatened with closure ever since. 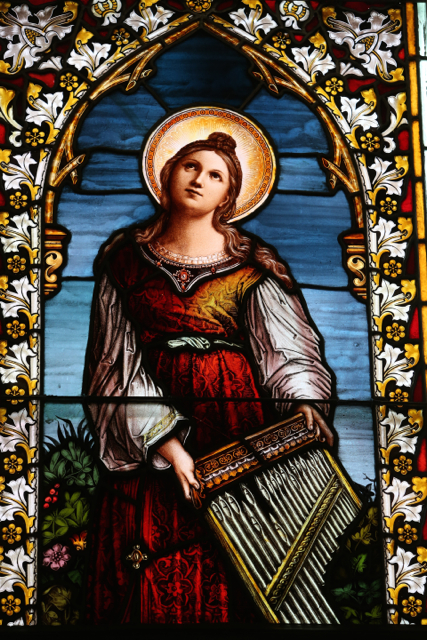 Yet St. Veronica’s struggled on. And partial recovery came in the form of the Ecuadorian community that had been ejected from St. Ann parish when Cardinal Egan demolished it. The Archdiocese offered the Ecuadorians a new home at St. Veronica’s. 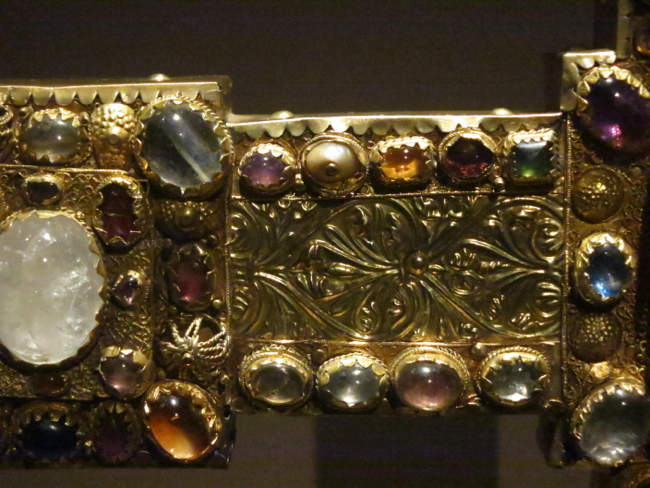 Given the condition of the church at that time, this was not at all a benevolent gesture! 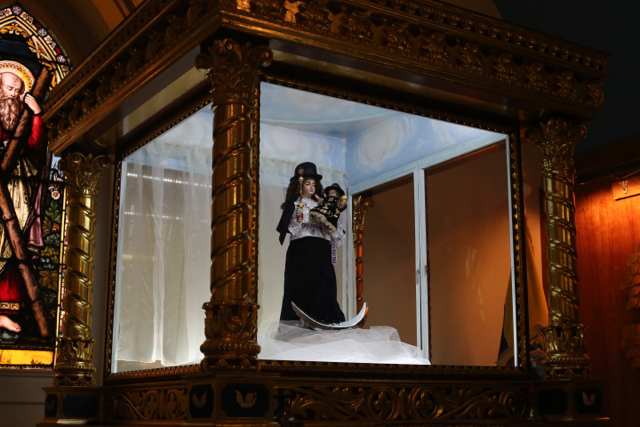 Yet the Ecuadorians made their way west bearing with them their elaborate glass and gold reliquary of our Lady of Quinche, patroness of Ecuador. And in the course of time the neighborhood of the parish changed once again: the homosexual scene moved further north to Chelsea. Christopher Street became one more placid residential street (if such a thing is possible in the Village). The austere red brick façade of St. Veronica’s testifies to the limited financial resources of the parish and seems a little out of place for a church completed in 1903, when New York parishes were reveling in French cathedrals, Byzantine domes and Venetian Palazzi. The coarser appearance of St. Veronica’s seems to hark back to the prior “Victorian” age. Of course, this church, although it was completed in 1903, had actually been started many years earlier. But even with these reservations, we cannot deny that the modestly dimensioned façade with its white facing and twin towers does create a certain presence in the midst of the nondescript low rise buildings of Christopher Street. The interior comes as a great surprise. 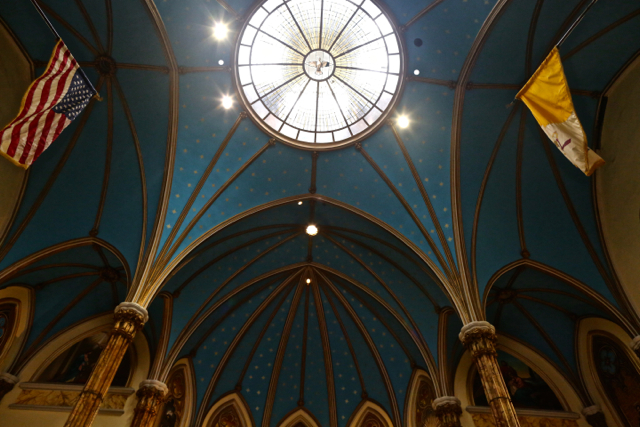 Instead of the expected Gothic basilica one encounters a rectangular, almost centralized space. The interior makes up in height for the limited available floor space: the ceilings are crowned by a series of skylights. And there are two balconies, not just one. Hidden away in the first balcony is a “Shrine to the Victims of AIDS” from 1992 – mainly a set of plaques bearing the names of the deceased. It is a typical gesture of the Cardinal O’Connor years: perhaps well-intentioned but without any further significance or follow-up. Undoubtedly, thanks to the care of the Ecuadorians, the condition of the church has drastically improved. The interior is gaily painted. This includes frescoes of somewhat indifferent quality. One wonders if this art is at least partially original or if the same artists who have left their mark at St. Bernard’s or at Sacred Heart were also active here. The artistic standard of other decorations, however, is very respectable indeed. 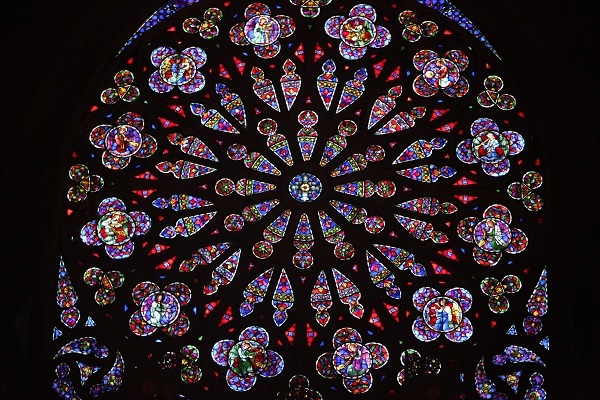 The stained glass, if not of the absolute highest quality, is nevertheless very fine and extremely well preserved. 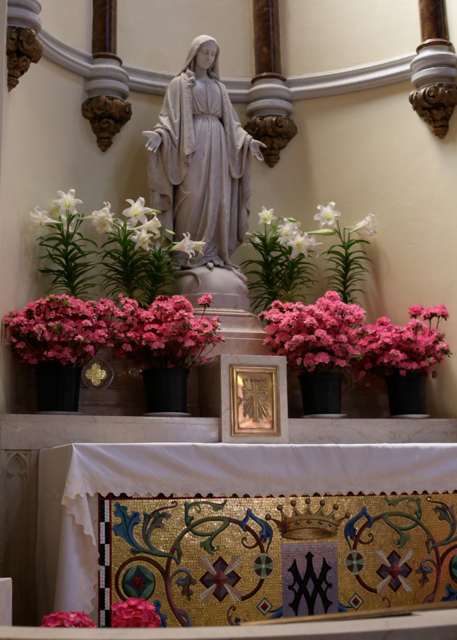 The statues and the altars show that those early parishioners had made some great sacrifices to acquire the finest adornments for their church. From the look of the main altar the last major decorative work in the church was done in the 1920s. The Council has let its scars, such as the sawing off the altar from the reredos. Mercifully, however, because of this parish’s poverty, very little more could be done. 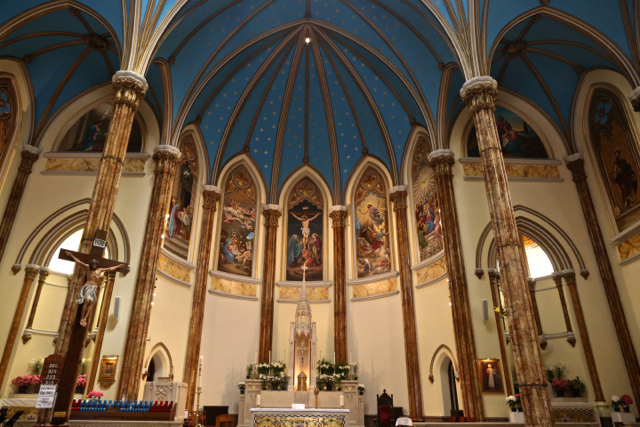 St. Veronica’s was spared the wholesale puritanical destruction that took place at nearby St. Joseph’s in the 1970’s. 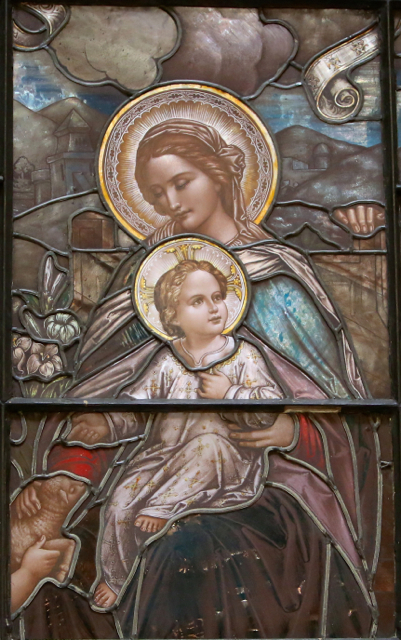 The patroness of the parish. 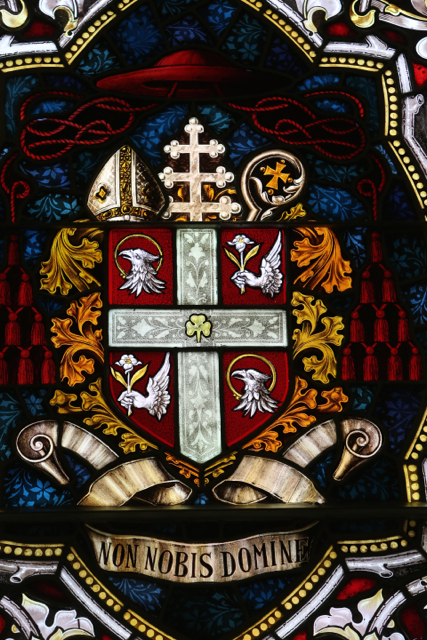 (Above) The coat of arms of Archbishop Farley ( Archbishop of New York 1902-1918). 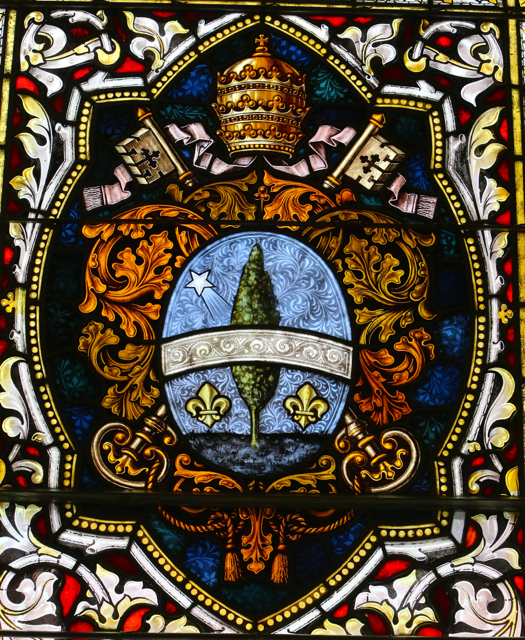 In the sources i have consulted the shield is azure not gules as here (Below) The coat of arms of Pope Leo XIII (Pope 1878-1903). 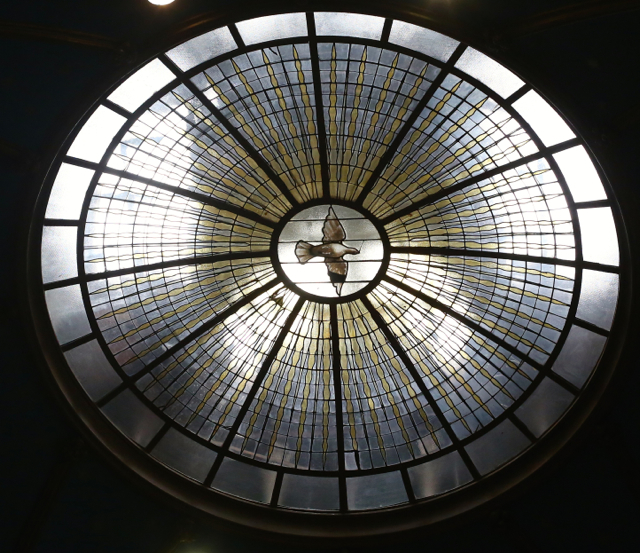 The Ecuadorians – because they have little money – have obviously spent a lot of time and effort to restoring this church. 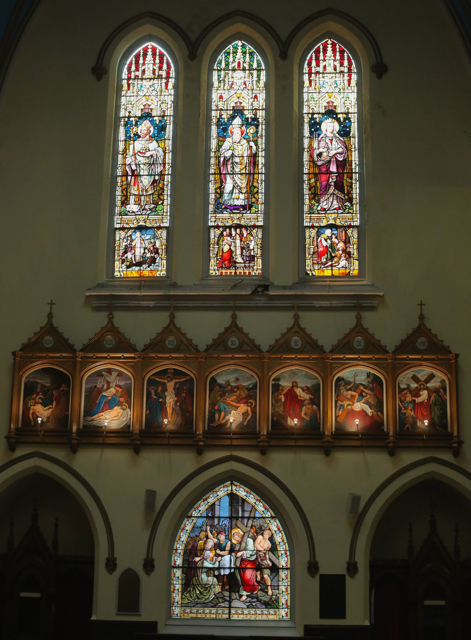 They had made similar efforts in the past at St. Ann’s – one hopes that the fate of their new parish will not be the same. In this church the banks of (real) votive candles are kept burning. 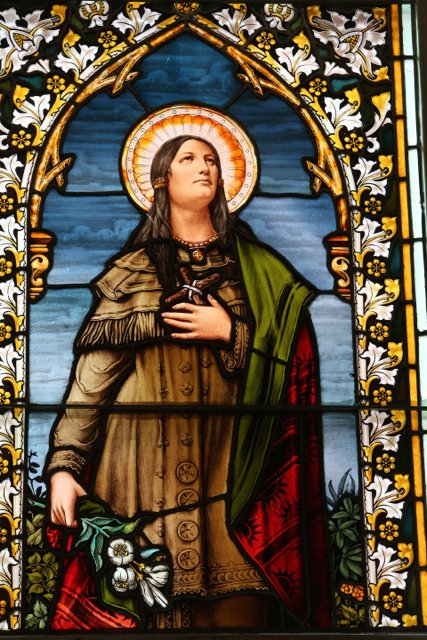 And there are many devotions- culminating in that of Our Lady of Quinche, patroness of Ecuador. Despite the small size of this parish, true fervor is evident. 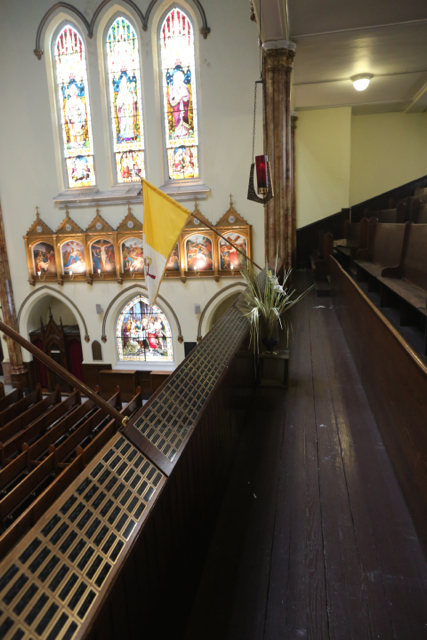 The community recognizes that a purely Ecuadorian congregation is insufficient to support a parish on the island of Manhattan and is currently trying to attract more parishioners. One problem definitely seems to be the limited time the parish is open. Just a block to the east is the entrance to the PATH train. I don’t see why this parish could not be “repurposed” as a minor commuter church if it were open at the right times and if an advertisement made the PATH commuters aware of what exist one block to the West. 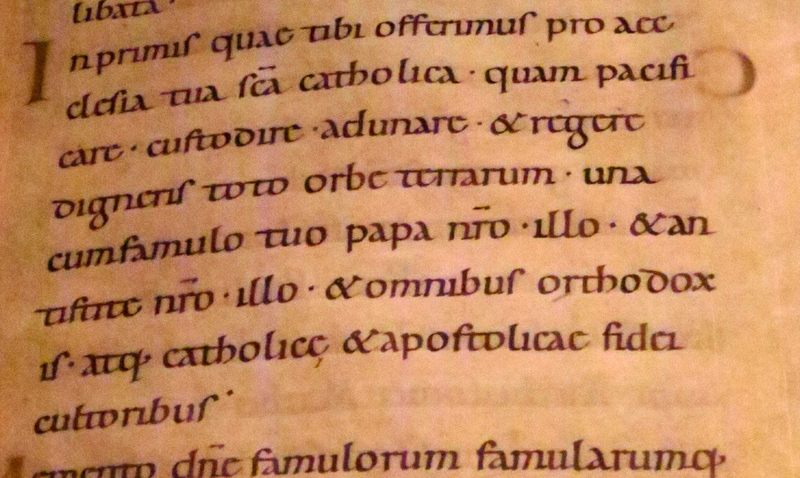 And should I not suggest, as a traditionalist, that the restoration of the Extraordinary form on at least a partial basis might go far in attracting a more “diverse” congregation? 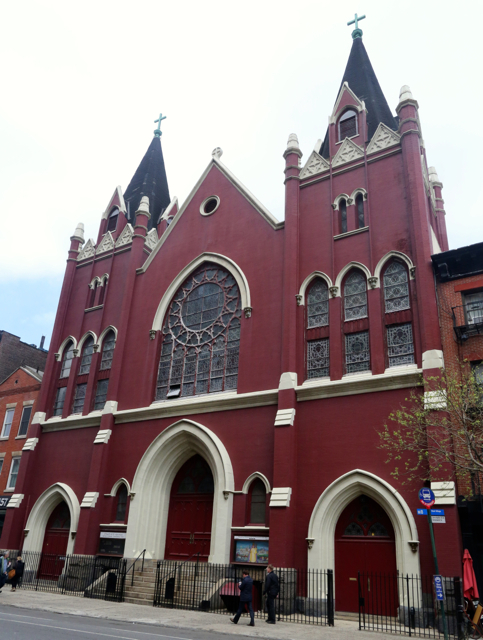 1) Thomas J. Shelley, Greenwich Village Catholics: St. Joseph’s Church and the Evolution of an Urban Faith Community 1829-2002 (The Catholic University Press, Washington, D.C. 2003) at 106-107. 2) Shelley, op.cit at 107-108. 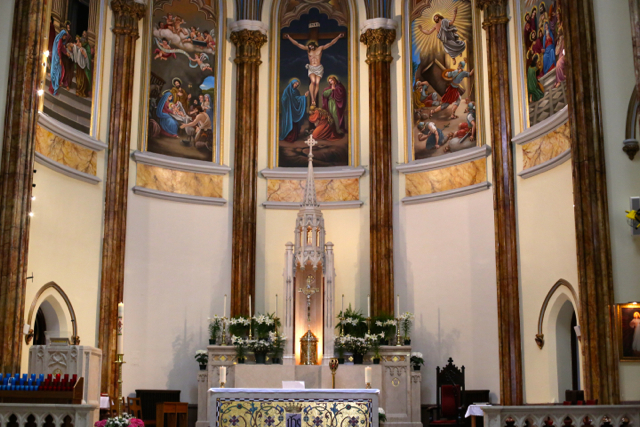 The new immigrants have nurtured so many of these churches and brought them back to life. Unfortunately I am not so sure they will survive the Dolan hit list. OL of Quinche was a feature at St. Ann’s shrine and Armenian Rite Cathedral…suspect it was transferred from that now-demolished church! Based on the preliminary recommendations, it seems that St. Veronica’s Church will be “consolidated” with St. Joseph’s Church on 6th Avenue. 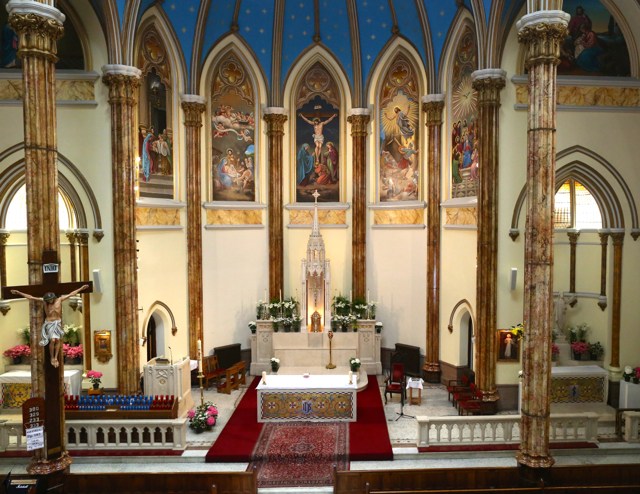 St. Joseph’s Church will remain the main site and St. Veronica’s will remain open only for weekend Masses and special occasions (weddings and funerals). This state of affairs is supposed to be evaluated every 2 years. We can all be sure that this will not last for too long! Felicitaciones, por esta bellisima iglesia.